Catherine de Médicis, the sixteenth-century queen of France, was actually born in Florence, Italy. Spinach was her favorite vegetable, and she took it with her to France and made the cooks place almost every meal on a bed of spinach. To honor her hometown, she called every dish with spinach à la florentine. So next time you see “Florentine” on a menu, you’ll know that the dish has lots of healthy spinach and you can toast the great Italian/French queen. Spinach is another wonder food that Italian cooks use a lot. It’s a great source of iron, beta-carotene, vitamins A, C, E, and K, and calcium. Spinach has lots of fiber to help keep your system running smoothly, and doctors believe it also helps fight against cancer, especially lung and breast cancer. The antioxidants in spinach (there are more than thirteen different kinds) have also been shown to help your body fight stomach, ovarian, prostate, and skin cancer. 1. Position a rack in the upper third of the oven and preheat the oven to 400°F. Lightly oil an 11 × 8-inch baking dish. 2. Heat 1 tablespoon of oil in a large saucepan over medium heat. Add the onion and cook until tender, about 5 minutes. In batches, letting the first addition wilt before adding another, add the spinach. Cook, stirring often, until the spinach begins to wilt, about 5 minutes. Drain in a colander. Using a rubber spatula, press the spinach well to remove excess liquid. Transfer to a bowl, and stir in 2 tablespoons Parmigiano, 1 tablespoon bread crumbs, 1/4 teaspoon salt, and 1/8 teaspoon pepper. Let stand until cool enough to handle. 3. Season the flounder fillets with the remaining 1/4 teaspoon salt and 1/8 teaspoon pepper. For each serving, place a fillet on the work surface, with the shinier skinned side up. Place one quarter of the spinach in the center of the fillet, shaping it into a compact log about 2 1/2 inches long. Fold over the right and left sides of the fillet to enclose the spinach. 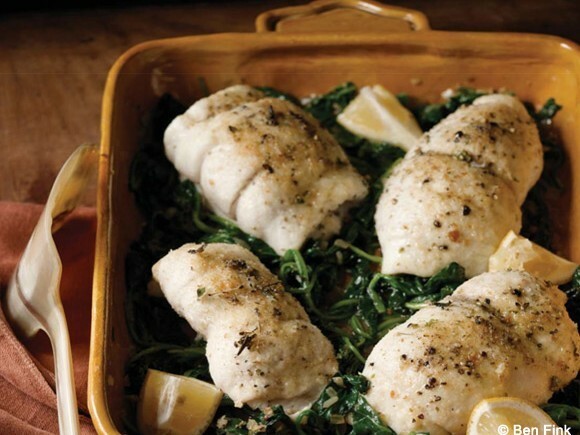 Arrange the flounder fillets, folded side down, in the baking dish. Drizzle the wine over the fish. Mix the remaining 2 tablespoons bread crumbs and 1 tablespoon Parmi- giano. Sprinkle the bread crumb mixture over the fillets, and drizzle with the remaining 1/2 tablespoon oil. 4. Bake until the flounder is opaque when pierced with the tip of a knife, 15 to 20 minutes. Serve hot, with the lemon wedges and a spoonful of the pan juices. Sprinkle the parsley over all.